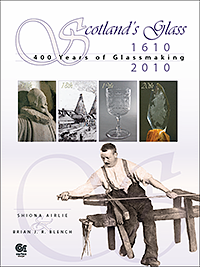 A full-colour book about Scottish glass is being published now to coincide with the 400th anniversary, 1610–2010. Written by Brian Blench (formerly Head of Decorative Arts in Glasgow Museums) and Shiona Airlie (former Director at The National Glass Centre, Sunderland), it is the first general history of Scottish Glass aimed at the general reader. Fully illustrated with over 200 full-colour photographs, it will encourage readers to tour the country and explore Scotland's wonderful glassmaking heritage for themselves. Sample Pages - Sneak A Peek! The book is large-format (280mm x 210mm), 77pp, full-colour, printed on quality art paper.